Make an appointment with his barber. I’m going Tuesday. There are any number of haircuts that we are allowed these days. This one would work a little better on me if I were a silver-maned millionaire with a St. Tropez tan. Maybe next year. In the meantime it’s more “Cary Grant” and less “Jim Carrey” for me. I’ll opt instead for a shorter back and sides while maintaining the length on top (for the most part.) At least that’s the plan today. Tomorrow is the acid test. The classic short sides and back is timeless. You may choose to wear your hair longer (like Tod’s founder Diego Della Valle) or shaved into a sort of all around five o’clock shadow to match your stubble (Jason Statham does this well. See his turn as “Handsome Rob” in “The Italian Job.”) But on the whole I’ve decided that I prefer to avoid making a statement with my hair. Like the suit that wears you and gets all the attention, a hairstyle that stands out shifts focus from your face to the top of your head. My attitude will change as I get older, I’m sure. 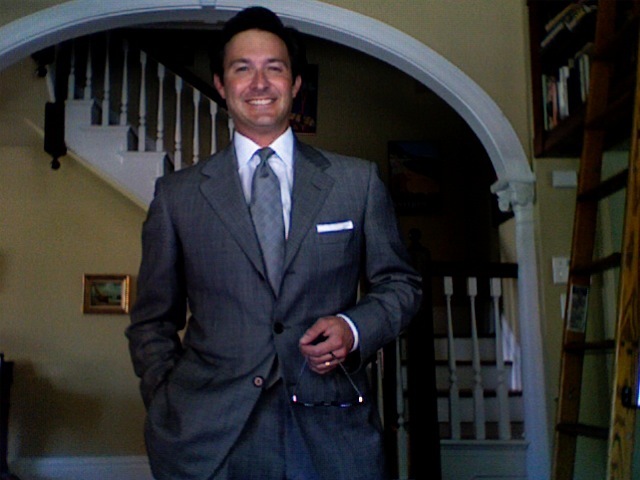 I like to think of this as my “North by Northwest” suit. It’s a close approximation and certainly as close as I’ll ever get to aping Mr. Grant; should I have had the chance to stand in his proximity, the comparison to a dancing chimpanzee would have been unavoidable. Call me Cheetah. But back to the suit. It’s an Oxxford make and is an example of a lighter weight fabric with a very subtle pattern (a windowpane overlay in darker grey and there is a faint light blue stripe that shadows it) that I think looks best with a crisp white, spread collar shirt (this one is an open weave that lets the air through) and a tonal grey (Prince of Wales) tie. A French (double) cuffed shirt and silver cuff links would dress this up even more. I should have worn my black captoes with it (and would if I were wearing the cufflinks), but swung to the dark brown suede plain toes instead. Serious enough for a Monday, lightweight enough for an 80ºF day. If, as is claimed by some, making a conscious effort at being happy, cheerful, optimistic, etc. will actually change your outlook, this is a good place to start. Wear and look your best on Monday. This entry was posted in Elegantology and tagged Cary Grant, Oxxford, tailored clothing. Bookmark the permalink. I absolutely love your blog (and several others) that show pictures and discuss traditional American/English clothing. That style and mode of dress is just downright classy. I personally am a Brooks Brothers girl myself, however I have to admit that us big busted ladies have a hard time carrying that look off. My question is, are there any ladies out there that have a blog like this? Dedicated to the WASP-y, traditional look? Bunny Tommerlin has a great blog, but not even pictures of women’s clothes. Anybody? You’re such a cutie pie! Hello Kate, I don’t know. There must be one. If not, corner the market! I’ll try and do a better job of including women’s wear in the posts. B-Squared is doing nice work these days! Friends and Family starts Wednesday (I think!) Thanks for the kind words. Thanks Fairfax. It’s strange to see myself without glasses though. Especially as I’m hitting the age where it’s better to wear them while shaving in the morning…. Are we going to get to see the after picture? And thanks for directing us to Kate’s blog. She certainly has a wonderful space to start with — as do you from what I’ve seen. You can get a tiny peek at my living room on Monday’s post. Very different style from most of the bloggers I follow. Today I’m off to Chicago for 48 hours to connect with my Pennsylvania sister whose husband will be there on biz. Art Institute and Michigan Ave. here we come! That’s a great look. An excellent way to start the week. Is that really a spread collar? Thank you CG, yes. But, it’s one of those off-the-rack Italian inspired numbers with a larger collar. I might call it a modified spread. I chose the shirt because it had the open weave that was much needed during the afternoon hours. Great shot, Chris, and beautiful suit. Wearing and looking your best on Monday is a great rule to live by and sets the tone for a happy and successful week. Thanks tig! Actually this was pre-crop. It’s hard to see the hair cascading over my collar and curling around my ears in this shot…. Wow~ Jealous of Mrs. E! I’m married to a jock who wears Under Armor and tennis shoes all the time. And…in reference to Wednesday’s post…a digital watch. Egad! Thank you Robin, Mrs. E. would tell you it’s a disease, but she bears my eccentricities with good grace.